Clippers have a pretty brutal week coming up, which includes games against the Trail Blazers, the Heat and the Lakers. Just so we don’t get too far ahead of ourselves, we’re going to focus on the Portland game, with special guest Sean Highkin from Portland Roundball Society. 1. What was the most surprising takeaway from the Clips’ New Years win over Portland? Sean Highkin, Portland Roundball Society: Gerald Wallace’s disappearance. His fingerprints have been all over every Blazer win this season, be it his through his scoring outburst against the Lakers or shutting down Kevin Durant on defense. Against the Clippers, Crash was nowhere to be found. Portland had plenty of problems elsewhere that night, but in light of the near-comeback they staged in the fourth quarter, even a small contribution from Wallace might have been enough to pull out the win. Charlie Widdoes, ClipperBlog: That the Clippers came away with the win. Portland’s attack seemed more balanced (like you’d expect), but somehow the Clips managed to run up a 17-point lead and hang on, even as Jamal Crawford keyed a furious, 36-point 4th quarter run. 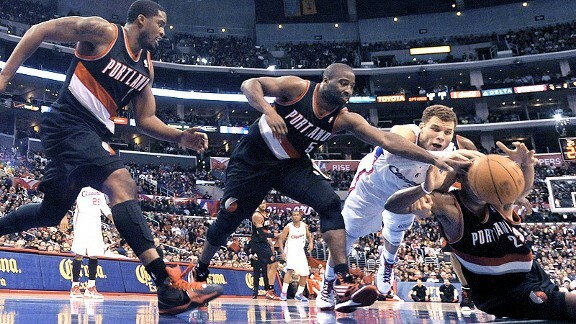 Breene Murphy, ClipperBlog: That the Clippers played defense. Up until that game the Clippers had the worst rated defense in the league and hadn’t shown much effort in the three previous games. And all of a sudden they held Portland to 52 points through three quarters? Shocked me for sure. 2. For this season only, which roster would you rather have? Sean Highkin, Portland Roundball Society: Portland’s. It’s hard to argue with Chris Paul and Blake Griffin as the core of a future contender, but as presently constituted, the Blazers are deeper, more versatile, and more cohesive. Charlie Widdoes, ClipperBlog: It’s really close, but I’ll take the Clippers. Portland possesses a distinct edge at this point in length, depth and cohesion, but the Clips have Blake Griffin, Chris Paul and what should be a devastating advantage on the boards before long. Blake puts as much pressure on opponents as almost any player in the league, and Paul is the guy I want with the ball down the stretch. Breene Murphy, ClipperBlog: “Rather have” is not “think will win more games,” so I’m going with the Clippers. I think Portland will probably have a better record over the course of the season, but I’m not sure that they’ll go deeper in the playoffs and I don’t think either team will win it all. Might as well have the team that has Chris Paul and Blake Griffin, since they’ll win a comparable amount of games. 3. Who wins this game at the Rose Garden? Sean Highkin, Portland Roundball Society: The Blazers played atrocious basketball for three quarters on New Year’s Day and still managed to only lose by 5. Following their sloppy play in their recent loss to Phoenix and win over Cleveland, they’ll be looking to get back on track with a convincing, start-to-finish performance like the ones they had against the Thunder and Lakers last week. Add to that the home-court advantage and their not wanting to lose to the same team twice in the first 10 games of the season, and I think Portland comes away with the win tonight. Charlie Widdoes, ClipperBlog: Clippers. Last time they played, the Clips had neither Chauncey Billups nor Reggie Evans in uniform. Evans is well on his way to making everyone forget about Lob City, with his ferocious rebounding ways, and Chauncey just adds more firepower to combat Portland’s relentless attack. Breene Murphy, ClipperBlog: Portland (reverse jinx?). The Clippers are going to be on Portland’s turf, and the Blazers figured out the Clips’ biggest defensive weakness: quick wings. Jamal Crawford definitely qualifies.